Go the fok to sleep? Heh. Oh! I get it. That is one well placed moon. Nice childrens book, bro. Anybody feel free to chime in on this one… what going on here? Is this a real book? It must be, right? It’s on Amazon. Do people really read it to their kids? Or is this the new hip thing with parents? 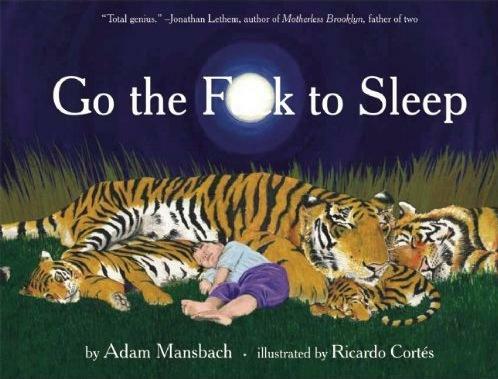 Like, their friends come over and the parents have this joke book stashed in with their other childrens books and they say to their friends, “Hey, go grab a book to read to little Johnny,” and snicker and giggle as their friend picks up this piece of crap? I must be missing something. What am I missing? Is this funny? This isn’t funny. I hope my humor never turns into parent humor… if that’s what this is? I need a nap. Thanks to my boy Jonesy for lobbing this up. This entry was posted in Entertainment, News and tagged Adam Mansbach, Amazon, childrens book, Go the fok to sleep, humor, Ricardo Cortes. Bookmark the permalink.